Danny Furlong was sent off in the second half. CONAN BYRNE’S DOUBLE and assist helped St Patrick’s Athletic beat 10-man Wexford Youths and move to third place in the SSE Airtricity League. Just six minutes were on the clock when Conan Byrne’s right-wing cross found Mark Timlin at the back-post and he headed in the opening goal. Three minutes later Eric Molloy rattled Brendan Clarke’s post having collected Paul Murphy’s through ball, a game changing incident with Pats doubling their lead moments later. Timlin turned provider crossing to Christy Fagan who controlled on his chest, holding off Gary Delaney’s weak challenge to volley in his sixth of the season. Pats always looked threatening with Conan Byrne’s crisp volley trebling the lead on 32 minutes, smashing the loose ball home after Billy Dennehy’s shot ricocheted. Conan Byrne grabbed his second of the evening on 57 minutes, drilling home Billy Dennehy’s rasping left wing cross having been threaded in by Christy Fagan. Wexford were reduced to 10 men before the restart after the fourth goal as Danny Furlong received his marching orders for dissent. Second-half substitute Dinny Corcoran squandered the chance to make it five with six minutes remaining, putting Byrne’s low cross wide of an open goal. Email “Byrne brace helps Saints rout Youths in Inchicore ”. 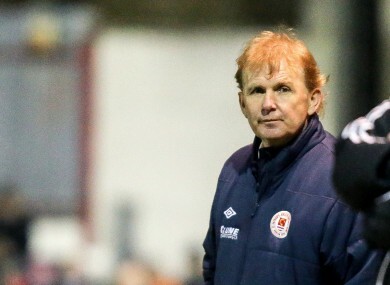 Feedback on “Byrne brace helps Saints rout Youths in Inchicore ”.